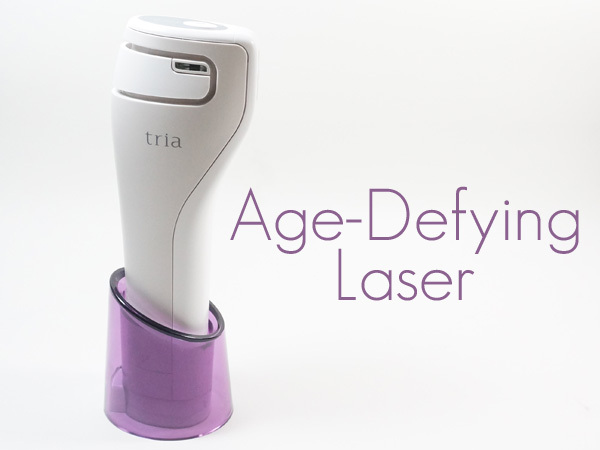 Tria Age-Defying Laser Introduction & Review. No matter how much I have done over the years to protect my skin from the sun and the environment, my age has caught up with me. I have fine lines and wrinkles that are deepening and I have age spots that are darkening. I am really searching for better ways to turn back the clock so to speak. I am looking for things like lasers and technology to look younger. One discovery I have been lucky enough to try is the latest in anti-aging at-home technology, the Age-Defying Laser from Tria Beauty. The Tria Age-Defying Laser uses the same non-ablative fractional laser technology that doctors use in their offices and it is FDA-cleared for home use. It delivers the same effective results previously only available by a professional treatment. What usually takes an hour in the doctor’s office and costs thousands of dollars now takes just a few minutes five days a week over a twelve week period of time -- and costs much less. This anti-aging laser is the only at-home laser clinically proven to treat multiple signs of aging on the entire face. You see, the laser stimulates the body's own natural renewal process by stimulating the production of collagen and elastin below the surface of the skin. In doing so, it helps to smooth out fine lines and wrinkles as it improves overall appearance and it gives the skin an overall more youthful, radiant look. The Tria Age-Defying Laser is very easy to use too. There are different levels so you can adjust to the device. With each level, the treatment is intensified and total treatment time increases. I have been using the anti-aging laser for three weeks now. For the first two weeks of treatment, I was on training level one, which was fairly easy. I used the laser for a total of two minutes over my entire face, broken up into four 30 second treatment zones - two cheeks, forehead and my chin area. The laser did get warm and I would experience some redness and tingling after treatment. It would feel like I had spent some time in the sun, but it would subside after a half hour or so. The further I got into my treatment, the longer the redness would last. After week two, I moved up to treatment level two, which was now a total treatment time of four minutes; treating each area for one minute. I definitely experienced more redness and heat during this time. I used the Finishing Serum after treatment to soothe my skin. I can feel that the Age-Defying Laser is doing something already; overall my skin has been more dry and tight. I think it is too soon to tell exactly what it is doing but I can tell that something is happening. If anything, I feel that my skin is more firm and possibly more even in tone. I get red very easily, so I am not sure if the evenness in tone is a rebound effect of not being red, or if it is my skin renewing already. Stay tuned for more updates as I continue along in my treatment.